Health officials are closing Utah Lake after finding a large toxic algae bloom in the water. The Utah Dept. of Environmental Quality said the closure is effective immediately because of the large, harmful algae bloom that may pose a serious health risk to the public and animals. Authorities said they believe the algae covers about 90 percent of the lake. Officials said lab results show the concentration of algal cells in the water are three times the threshold for closing a body of water. 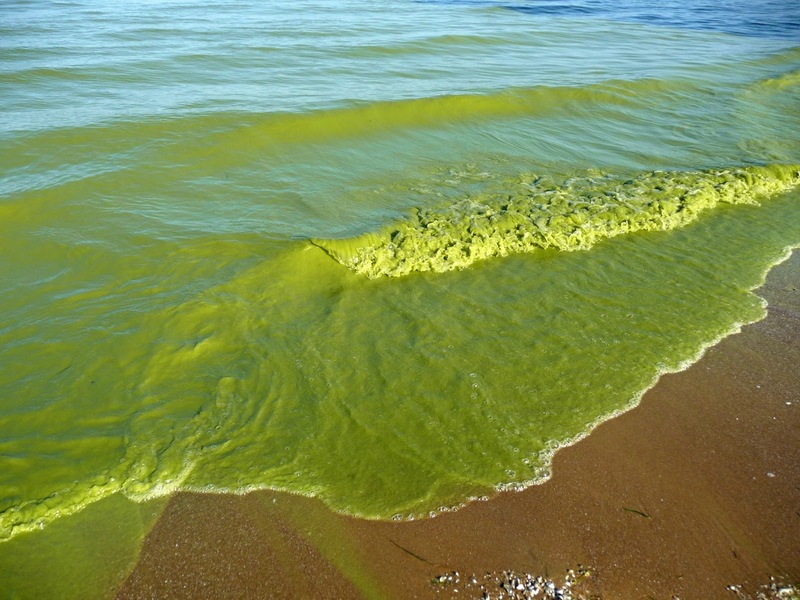 According to Dr. Joseph Miner, Executive Director of the Utah Department of Health, "These types of algae release neurotoxins and hepatotoxins, that can affect brain, nervous system, and liver function." These blooms can contain harmful cyanobacteria, a type of bacteria (often referred to as blue-green algae) that produces toxins that can pose risks to humans, wildlife, domestic animals and fish. Symptoms of cyanotoxin poisoning include headache, fever, diarrhea, abdominal pain, nausea and vomiting, and sometimes allergic-like reactions from skin contact. Advisories like this have been issued from UCHD in the past, bust this is the first time the entire lake has been closed, DEQ said. If you have taken fish from the Lake since July 10, 2016, state officials are urging you not to eat the fish. Fishing in river areas near Utah Lake is not recommended until further notice. Meanwhile Blue-green algae has been found in the Pit River Arm of Shasta Lake and officials are urging people to stay away. According to the Central Valley Regional Water Quality Control Board, federal, state, and county agencies are urging swimmers, boaters and recreational users to avoid direct contact with or use of waters containing the blue-green algae due to potential health risks. Sampling has confirmed the presence of cyanobacteria in the upper Pit River Arm of Shasta Lake Blue-green algae can pose health risks, particularly to children and pets. The Central Valley Regional Water Quality Control Board is urging people to choose safe activities when visiting the affected reaches of the Pit River Arm of Shasta Lake and recommend that people and their pets avoid contact with water in locations with blooms, and avoid swallowing or inhaling water spray in an algal bloom area. The algae bloom appears as bright green in the water with streaks that look like spilled paint. The blooms can also appear as blue-green, white or brown foam, scum or mats that can float on the water and accumulate along the shore. Officials said recreational exposure to toxic-blue algae can cause eye irritation, allergic skin rash, mouth ulcers, vomiting, diarrhea, and cold and flu-like symptoms. Liver failure, nerve damage and death have occurred in rare situations where large amount of contaminated water were directly ingested. High levels of toxic blue-green algae are still in Lake Afton, according to a statement from the Kansas Department of Health and Environment. Three other Kansas bodies of water are under warning, too: Central Park Lake in Shawnee County, Marion Reservoir in Marion County (but not Marion County Lake) and Milford Reservoir in Dickson and Geary counties. 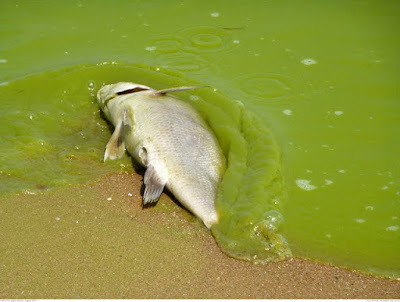 Blue-green algae generally grows in lakes, ponds and slow-moving streams, especially when the water is warm. The algae often looks like spilled green paint and can cause skin irritation and more serious complications if swallowed. Despite its risks and explicit warnings from park officials last week, families chose to wade in the water with children at Lake Afton over the holiday weekend. "Kansans should be aware that blooms are unpredictable," the department said in a statement. "They can develop rapidly and may float around the lake, requiring visitors to exercise their best judgment." Pets that swim in or drink water with an algae bloom, or that eat dried algae along the shore, may become seriously ill or die. The state says it's safe to eat fish caught during blue-green algae outbreaks, as long as the fish are rinsed with clean water and only the fillet portion is consumed. People should wash their hands after handling the fish. 's does not indicate plural.